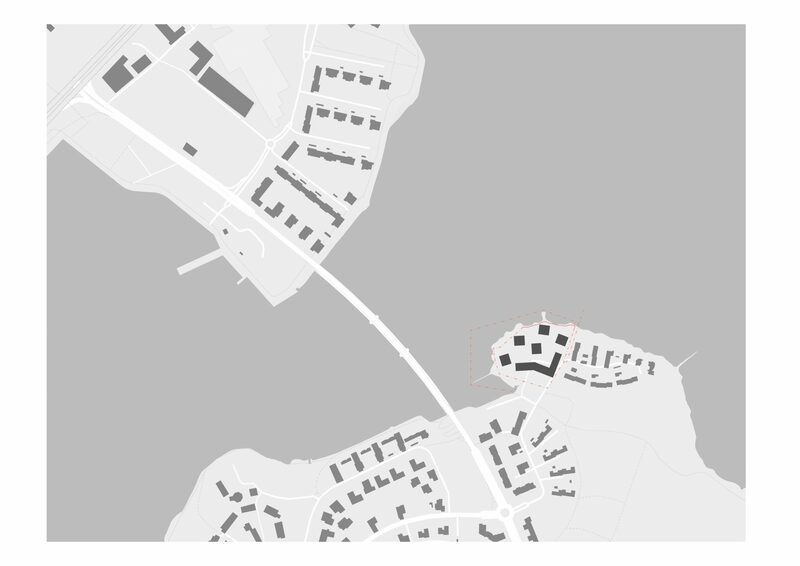 The identity of area under design is characterized by its location by the Jyväsjärvi Lake in a site surrounded by a beautiful landscape with open views over the lake to the north and north-west to the Lutakko neighborhood. 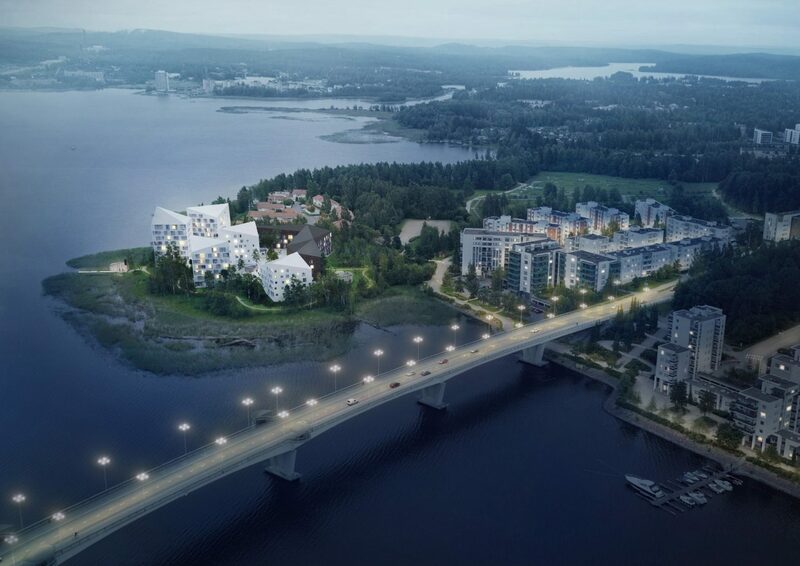 The location of the site also sets high demands on the design of the buildings to be places there as they will form a highly visible part of the landscape when viewed from the Kuokkala bridge and from across the lake. The plan proposes a combination of three-story buildings and up to eight stories high taller buildings. The long three-story building in the south-east corner of the area serves as a “spine” for the plan creating a lower border line for the area to the south while allowing sunlight to reach the yard and the other buildings in the area. The other buildings are up to eight stories tall blocks arranged in a free from arrangement in such a way as to allow for views to the lake and to the southern exposure from each of the buildings. 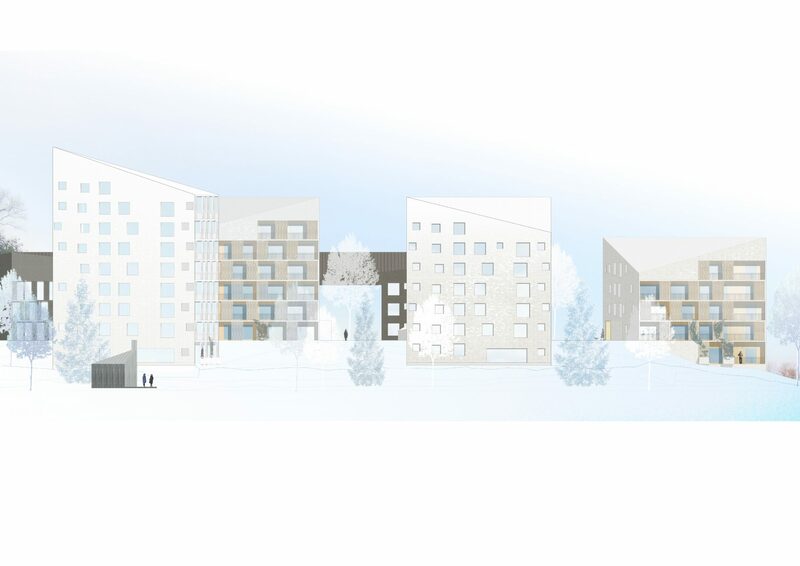 The faceted roof scape along with a light colored overall appearance of the buildings in the plan give the area a character that sets into a dialogue with the surrounding landscape. The diagonally gabled roof shapes create a sense of variety and rhythm to the buildings and make them appear different when viewed from different angles. 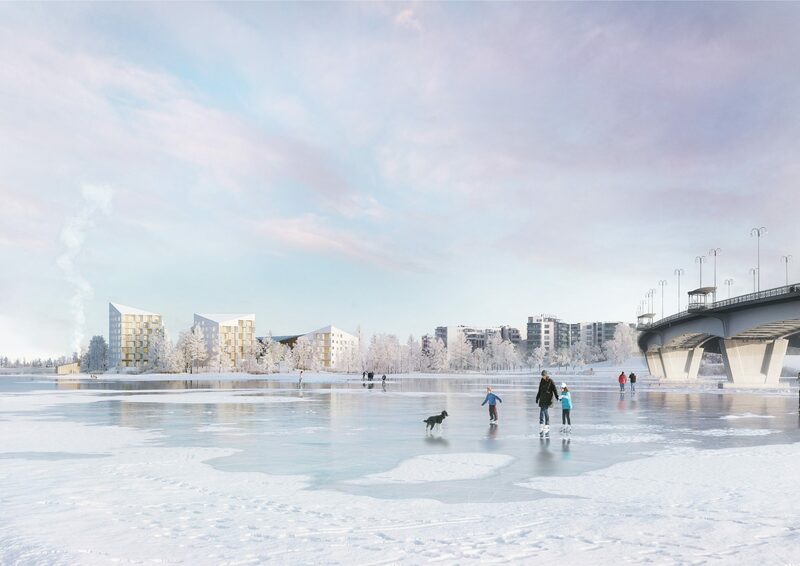 The shapes of the buildings depart markedly from those of the rest of the Kuokkala Shore, and especially when viewed along the long vistas they form a recognizable and unique silhouette. The lower southern-most building with its darker facade forms a harmonious backdrop for the taller light colored buildings. The buildings rise taller towards the northern part of the area. Each building has two facades with a row of balconies running the length of the entire façade while the remaining two facades have a less open appearance. The design with row of balconies running the entire length of the two facades gives each apartment a maximal amount of balcony space. It also serves as a protective zone between the apartments sheltering them from exposure to direct sunlight as well as from noise from the outside. 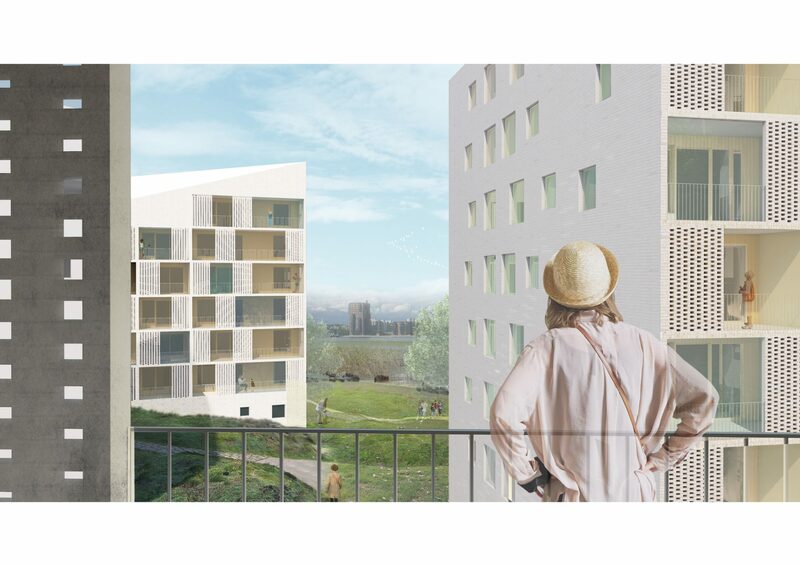 The partly free form arrangement of the individual buildings affords each apartment with optimal views into the surrounding natural landscape. The floor plan follows the guidelines set in the competition program. All apartments have ample sunlight and afford views to the most optimal direction depending on where the apartment is situated in the building. The floor plans of the individual apartments have been designed in such a way as to facilitate flexibility in combining several units and in varying the plan from floor to floor. In the long three-story building it is also possible to produce the apartments in a mirrored plan so as to make the balconies open to the inner year if so desired. The inner courtyards that are formed between the building blocks are all oriented towards the direction of the morning, day and evening sun. The more public functions are placed along the paths between the blocks, and the closer to the building one gets, the more private and quiet it turns. The privacy of the inner courtyards is realized by creating a stepped terrain and by planting greenery that shelters the yards. Dells are also proposed in order to facilitate the delayed movement of runoff water. The staggering of the buildings between three and eight stories allows them to relate to the scale of surrounding landscape in the natural manner. In strategic places some trees will be cleared in order to allow for open views onto the lake. However, apart from that the trees in the shore will be left untouched. 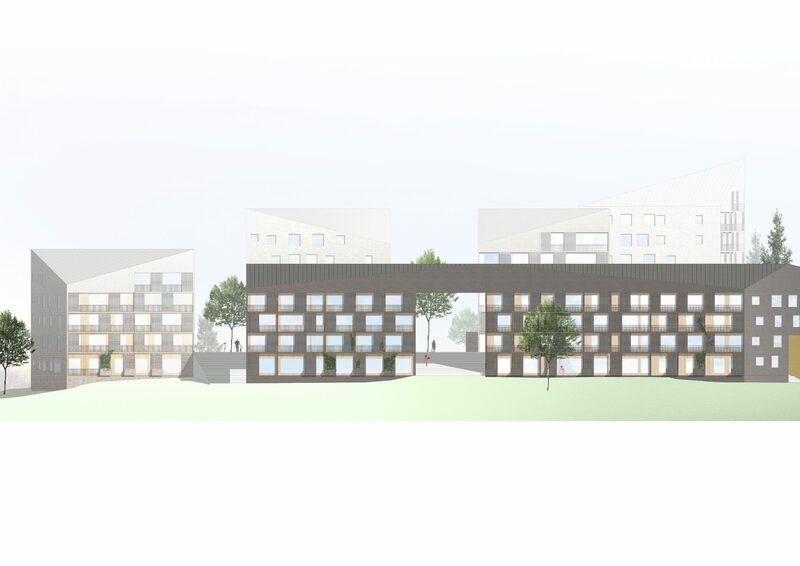 The competition entry proposes an extension to the Suuruspää block park to extend to the south across the Suuruspäätie road. 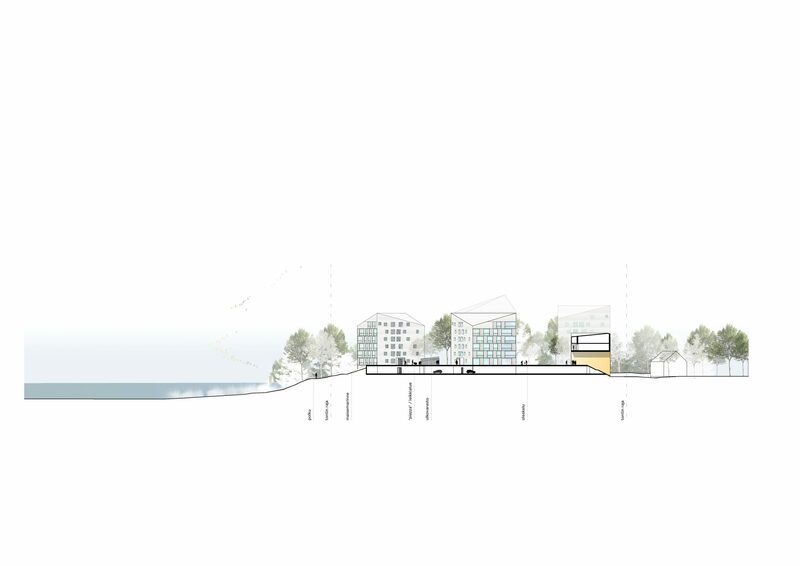 This would also allow the Rantaraitti lane by the shore to better serve the new housing area to be built. 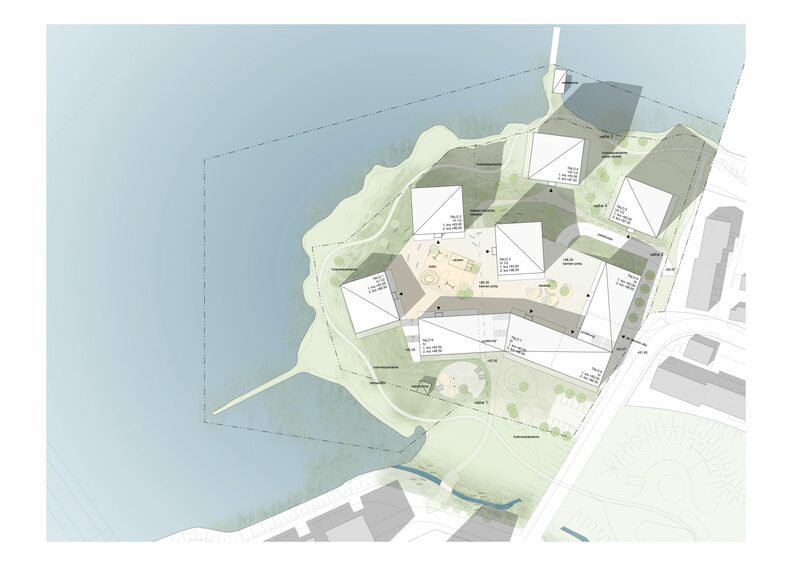 On the north shore of the area there will be a shared sauna serving the residents of the new housing area. The sauna affords views over the lake in three directions. The buildings have facades in brick, mostly in clean slammed burnt brick complemented with sections with glazed brick. The low three-story building has dark colored brick while in the taller building light colored brick is used. In the rows of balconies, so-called laced brick is used as an additional element to provide privacy for the balconies. The balconies have terrace glazing and steel bars. The panes of the roof are made of engine bonnet of the same color as the façade of the building. The bearing structure made of concrete helps to store heat and regulate the temperature in the buildings. Also the floor plates are made of concrete.